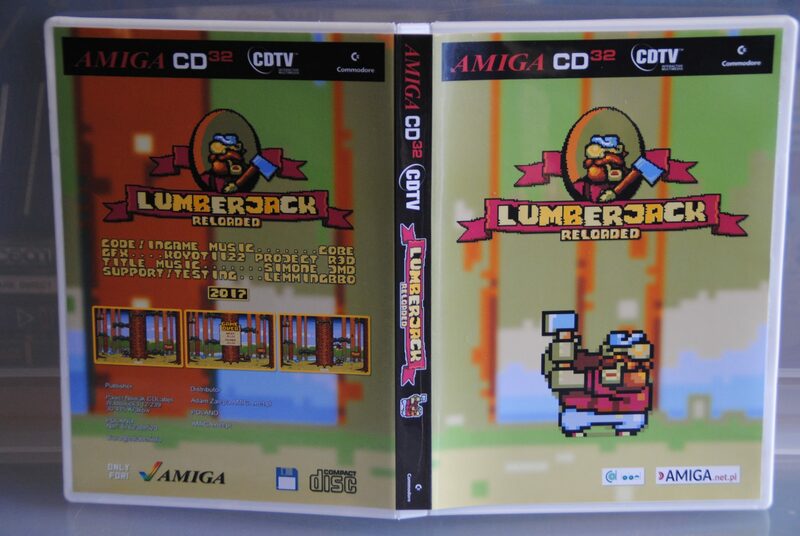 Lumberjack Reloaded for the Amiga came out a couple months ago now, the reason for this late article is that i wanted to try the game a bit more on various hardware here. 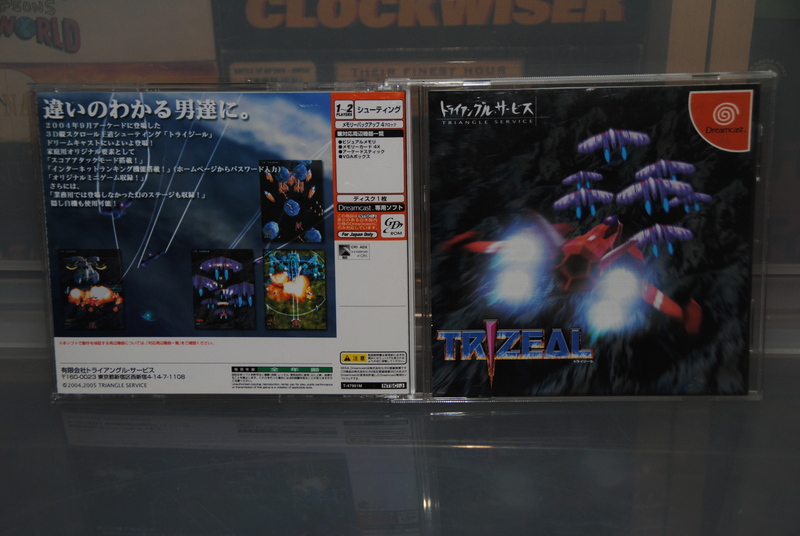 There are two versions available, 1 CD version (CD32/CDTV) and 1 Floppy version and the one i got is the CD version which works on both the CDTV and the CD32. 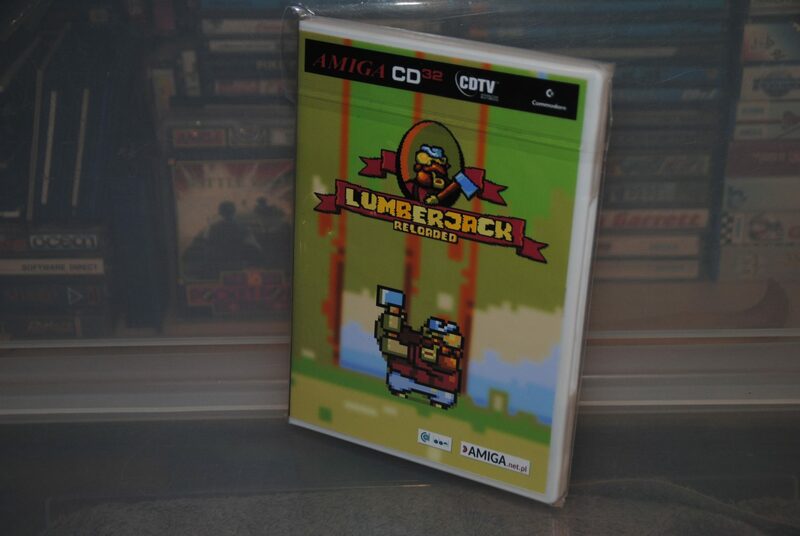 Every version of Lumberjack Reloaded comes in a white DVD case and while it says sealed it is only one of those that you can open and close as much as you like, yes this means that i still got a sealed copy after i tested the game and wrote this article :p.
There are some things about this box that i like but for the most part i hate it, there ain’t any design here and i find it quite frustrating to see yet another box that doesn’t fit next to the other “new” Amiga titles lately. I love how they fit the CD32 stuff there but adding that CDTV logo and so on feels so unprofessional. 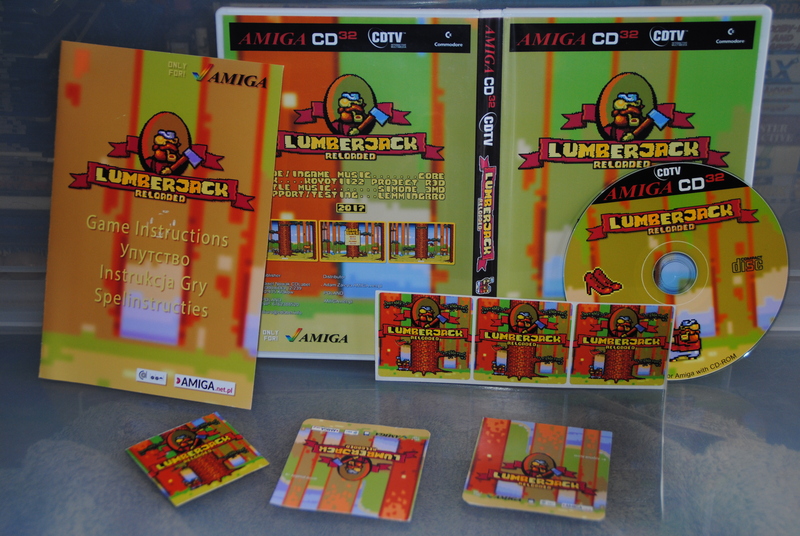 I know Amiga.net.pl can do better than this as the other boxes so far from them look so much better / more in line with the standard too. The manual is tiny but well made and laid out very well, can’t complain at all on that one. 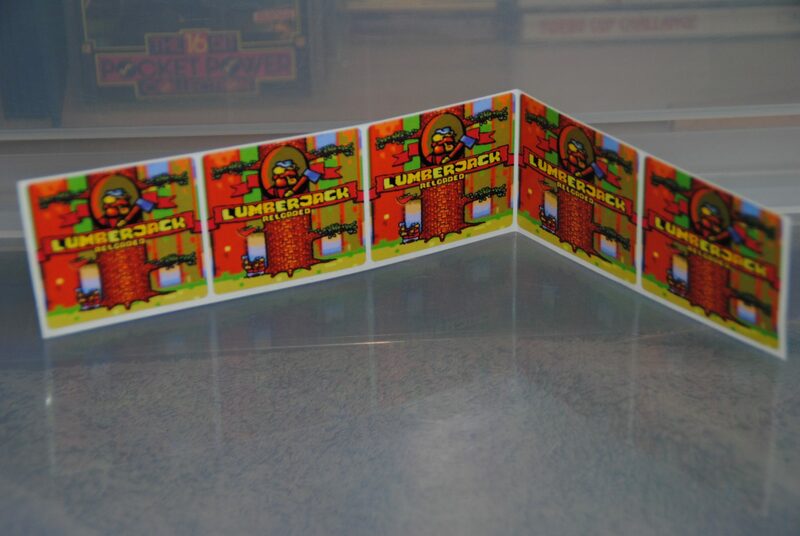 The CD is another good example of how good something can look with very little resources, it is basically just the front DVD cover but it simply fits the CD perfect, clean and good looking. I didn’t get the floppy version but stickers were included anyways which is a nice concept that is getting pretty common on the Amiga now, good looking are they too and the design fits the floppy perfectly. 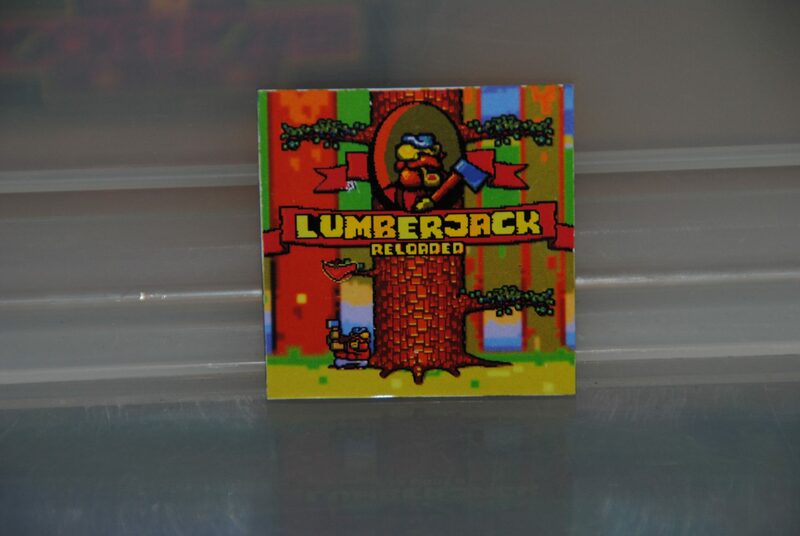 More extras, Lumberjack Reloaded stickers!. I am not a fan of stickers in general but they look great and i guess I’ll use them as “freebies” in my “loot like crates” that i send out to my friends and fellow collectors around the globe. A pretty big fridge magnet is also part of the box, lovely stuff and definitely one that i won’t give away or something like that. 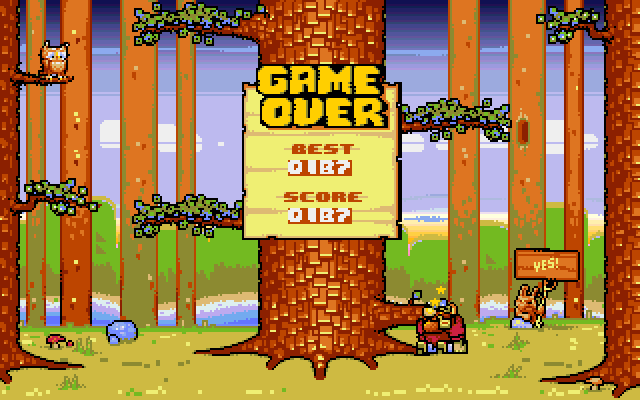 The game itself is pretty straightforward and a typical “mobile phone” app in the sense that it is on one screen and highly addictive stuff. 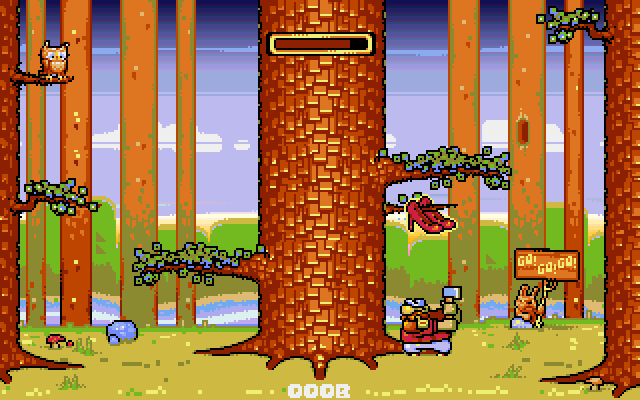 You chop down sections of a tree and have to switch sides if there’s a branch sticking out. Being quick is the key to success and this is only possible with a lot of practice. The graphics and music in the game do the job pretty good but what makes it even better is the controls and responsiveness which is essential in a game like this. 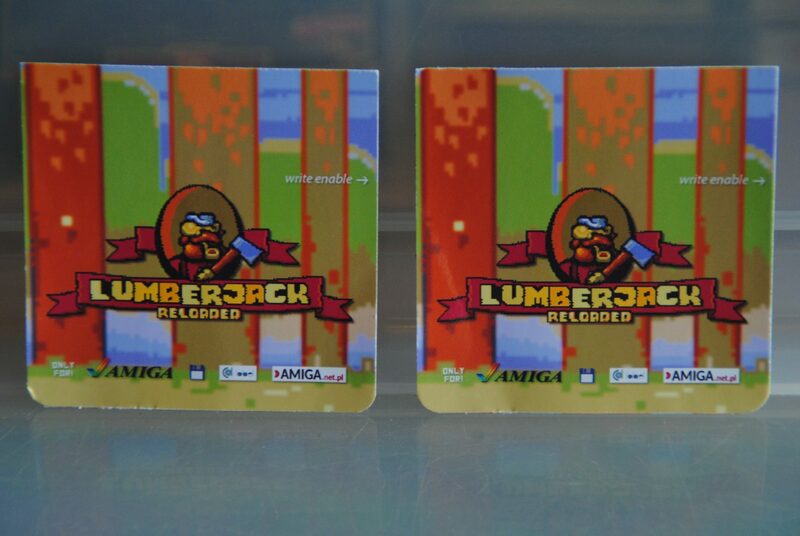 The game originates from the Commodore 64 and quite popular too, what the differences between that one and this Amiga reloaded version i do not know yet. Here’s a video of how it plays (thanks to ZZielins) (along with his unboxing), I have no connection to his channel other than me being a subscriber. Subscribing to ZZielins on Youtube might not be the worst thing you will ever do if you are into Amiga stuff. Here is all the stuff in the box, great stuff all in all but that DVD box could have been so much better really, anyways this is a tiny game release with a full box & extras release to please collectors like myself so i won’t deduct any points because of that. 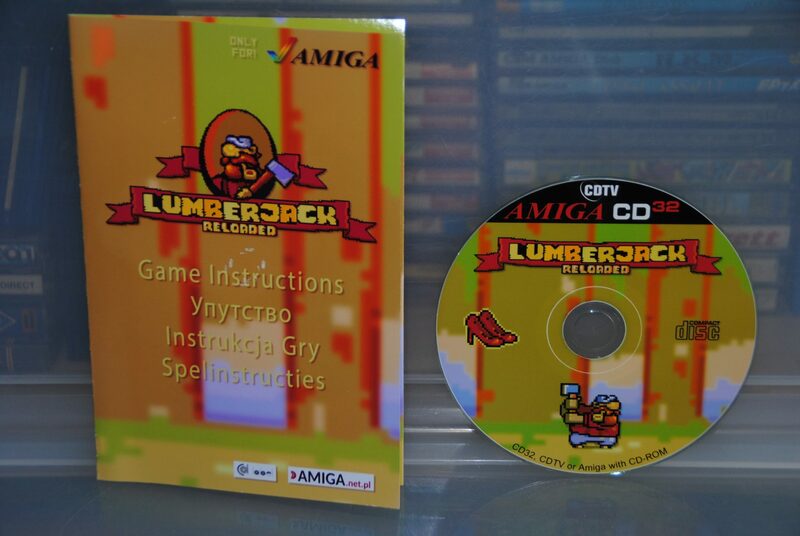 Pretty decent release for such a low sum ( 7 Euros ), Link for ordering the game directly from Amiga.net.pl is here. I think so too. I already tried with Nightdive Studios, but they did not answer my mails. I guess they are too busy with “System Shock” remake.